It was an early morning, up at 5:45 am to get to the church by 6:30. Jet, Isabel, and George got up with us, and went with us there, through streets that were a good four inches thick with snow. 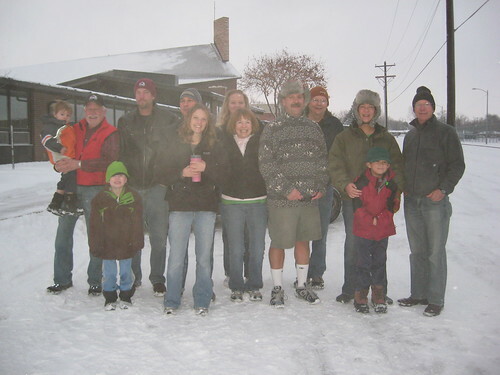 The Longmont snow crews were out plowing and the world as ghostly white. It seems nearly impossible now that I'm in t-shirt weather, under a sky spitting little bits of rain, and standing out in the parking lot talking to Jet on the celphone. The whole set of pictures. I'll be adding to it as I go. Everyone was at the church by 7, and we took off in three vans for the airport, with one big trailer taking much of the heavier luggage. We got to the airport by 8:30, checked in with no problems and still had two hours to get some breakfast with everyone at the Rock Bottom Brewery at our end of the concourse. Judy was a wonderful person and went to the airport yesterday to get all our boarding passes for Southwest airlines, so we were all in the A group and managed to mostly sit together on the plane. The flight was at 10:30 and despite a 15 minute delay to de-ice the plane we got to New Orleans only five minutes late. The flight itself was smooth That was a very nice surprise the other way around. We all managed to make it to Advantage Rental despite the fact that all the rental car counters were closed. The New Orleans airport was dead this week after Mardi Gras. I was somewhat surprised by that, especially Sunday evening when people might have been trying to get home. When we waited for the last folks of our group to arrive on other flights from Philly and Oregon, we went and visited the Mississippi, just stood on the bank and looked over the water. The levy had a biking path on it, and we encountered one biker that was just bombing along happily as it was flat as can be. There wasn't much wind and it was in the low 60's. Warm compared to the blowing snow and ice we'd left. 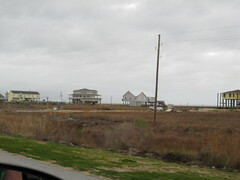 Still... we went the scenic route, going east along highway 90, through towns, along a finger of land that was flanked, on both sides by stilt houses, seafood companies, and water and even more water. It was beautiful out there. I am one of the designated drivers for the cars, and ours is a huge old Buick SUV that can comfortably seat five with all the luggage piled up to the ceiling in the back. It had a good solid engine, so I was comfortable passing on the two-lane highways. I'd actually done this route before, and I had fun going through Waveland, as that felt as if it was the gateway to the road out to Biloxi. I really enjoyed driving through the towns and everyone looked all around trying to see the changes that had happened since they'd last been there. Some of the folks had come two years ago, others had been with us last year, and the changes weren't as great as the two year folks had hoped, in some ways. A number of the strip malls were still derelict, and lots of houses were still just gone, but there were many more that were up again. When we got to Shaggy's we stopped and had a great dinner. I was starving as we'd only had breakfast today, so John and I went a little overboard, but in a good way. We had a dozen raw, fresh local oysters, I had most of a bowl of gumbo, a plate of sweet potato fries that other people mooched off of gently. John shared part of a shrimp po'boy, so we had plenty to eat. Shaggy's is a two-story building with cloth walls, and not a lot to it. Each time a hurricane comes through, they just tie up the walls, take all the equipment inland, and then leave the rest up to chance. There's a picture of it during Gustov, with the waves going over the second floor of the building. One really cool thing was that just as we were finishing dinner, my mother called to say that she got the chrysanthemum painting I'd sent her and that the backing job I'd done on it was really good. I'd sent it to her in part because she'd liked the painting when she'd seen it, and in part so that she could check the work that John and I had done on our own. I'm very glad that she liked what she saw and that it worked out well for her. On the way to Back Bay we saw a lot of new restaurants, and some new signs of business and life. It was really cool to see, and it's likely that we'll drop by a few of them in order contribute to the local economy. 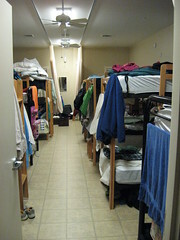 The Back Bay Mission built a new volunteers' dorm, two rooms that each hold 20 people, with an attached bathroom. The building is beautiful and white and has enclosed porches in front. It's new and beautiful, so the accommodation's are nicer than they were two years ago, though not as private as they were a year ago; but the bathrooms and showers can deal with far more people than they could last year. I'm glad of that. We got here around 7:30 and the men had to take apart one of the bunks to move it to the men's dorm, along with the mattresses. When all that cleared out I was able to make my bed and figure things out. I took a top bunk, and while I'm not that good in group situations, it was something that pretty much everyone just dealt with, and it turned out that there was a bag full of earplugs out in the common room. I took a pair and found that it did help a lot when I really needed to tune everyone else out. One of the ladies volunteered to do the cooking for the whole group for breakfast and set things out for lunch. So we don't have to worry about them. That was really nice of them, and they're feeling more useful with something to do that isn't just construction. The wireless in the dorm room exists, but I'm sharing it with half a dozen others. While I can upload my pictures, it's kind of hogging the network that exists. We also found out that the blitz build isn't happening. Instead, we're going to be going to three different jobs, one roofing job, one tiling job, and one finishing job for nearly all of the interior of a house that's been completely gutted. We'll just be scattered to the three winds again instead of just working on one house for the whole time. I'm mildly disappointed, but we'll still be doing work that people need. Glad to hear the cold's receded, but aie at a 6am start. Have fun! It was pretty aie... *laughs* Luckily for the rest of this week I *should* be able to get up around 7 or even 7:30 if I push it *laughs* We just have to be on the site by 8, now. Thanks! We are having a lot of fun. 60F?! Oh man I am so jealous. It was 15F here this morning. Even though it hasn't come back as far as everyone would like, even a few new business and construction are a good thing.